Myositis Ossificans is extra-skeletal ossification that occurs in muscles & other soft tissues. If you have a bad muscle strain or contusion (dead leg!) and it is neglected then you could be unlucky enough to get Myositis. It is usually as a result of impact which causes damage to the sheath that surrounds a bone (periostium) as well as to the muscle. Bone will grow within the muscle (called calcification) which is painful. The bone will grow 2 to 4 weeks after the injury and be mature bone within 3 to 6 months. It is characterized by fibrous, osseous and cartilaginous proliferation and by metaplasia. The term myo and itis is a misnomer because skeletal muscle is often not involved and inflammatory changes are rarely evident. Also in early phase of evolution, formation of bone may not be observed, so term ossificans is not always applicable. Most people if not all, have a history of trauma, simple severe blow or series of repeated minor traumas. Condition may be classified according to its location as extra osseous, periosteal or parosteal. Haematoma seems to be necessary prerequisite. Muscles most often involved are brachialis, quadriceps femoris and adductor muscles of thigh. It is significant that these muscles gain attachment to bone over a wide surface area, suggesting that periosteum participates to some extent in the process. Commonly young athletic men are predisposed with Myositis. Region of elbow is a favorite site, and when the process appears to restrict elbow motion progressively, ill advised forcible manipulation will cause a widespread involvement. Not applying cold therapy and compression immediately after the injury. If the ossification is located in the adductor muscles, it is known as "Prussian's disease". Muscle is commonly but not invariably involved, and fascia, tendon and periosteum can also be the site. Process is peculiar alteration within the ground substance of connective tissue, associated with striking proliferation of undifferentiated mesenchymal cells. Initially there is degeneration and necrosis, in case of muscle, disrupted muscle fibers retract. In 3 to 4 days, fibroblasts from endomysium invade damaged area and rapidly form broad sheets of immature fibroblasts. At the same time, primitive mesenchymal cells proliferate within injured connective tissue. Intense cellular proliferation of fibroblasts and mesenchymal cells produces a histological picture that may be erroneously diagnosed as fibrosarcoma or myosarcoma. Ground substance becomes homogeneous or glassy or waxy, suggesting some type of edema. It increases in amount and encloses some of mesenchymal cells, which then assume the morphological characteristic of osteoblasts. Mineralization follows and bone is formed. This events typically takes place first within least damaged part i.e. periphery. As the process of osteoid formation and mineralization changing in mature bone evolves, it progressively extends towards the central, severely damaged area. When myositis is not removed and is allowed to mature, it becomes oriented and covered by a cartilaginous cap, because of muscle action over the lesion. This is called post traumatic osteochondroma and is common in region of knee joint. The specific cause and pathophysiology are unclear - it may be caused by an interaction between local factors (e.g., a reserve of available calcium in adjacent skeletal tissue or soft tissue edema, vascular stasis tissue hypoxia or mesenchymal cells with osteoblastic activity) and unknown systemic factors. The basic mechanism is the inappropriate differentiation of fibroblasts into bone-forming cells (osteoblasts). Early edema of connective tissue proceeds to tissue with foci of calcification and then to maturation of calcification and ossification. In the first, and by far most common type, nonhereditary myositis ossificans (commonly referred to simply as "myositis ossificans"), calcifications occur at the site of injured muscle, most commonly in the arms or in the quadriceps of the thighs. The term myositis ossificans traumatica is sometimes used when the condition is due to trauma. It is passive stretching then active exercise, is responsible for bone formation. The second condition, myositis ossificans progressiva (also referred to as fibrodysplasia ossificans progressiva) is an inherited affliction, autosomal dominant pattern, in which the ossification can occur without injury, and typically grows in a predictable pattern. IP joint of thumb, large toe and spine are liable to fuse. All joint motion is finally lost and patient dies of inter current infection. This condition is very rare. Radiation therapy subsequent to the injury or as a preventive measure of recurrence may be applied but its usefulness is inconclusive. Treatment is initially conservative, as some patients' calcifications will spontaneously be reabsorbed, and others will have minimal symptoms. In occasional cases, surgical debridement of the abnormal tissue is required, although success of such therapy is limited. Maintain available range of motion but avoid stretching and massage, until maturation. iontophoresis with 2 % acetic acid solution. Growth should not be removed in premature stage as it will likely reoccur. The ossification becomes exuberant, infiltrates beyond the original site, and compresses the soft tissues around beyond hope of repair. 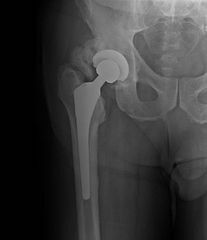 When after serial x-rays the mass is dense, well delineated, and at a stand still, it may be safely removed. It may be possible to prevent myositis by aspirating the original haematoma.